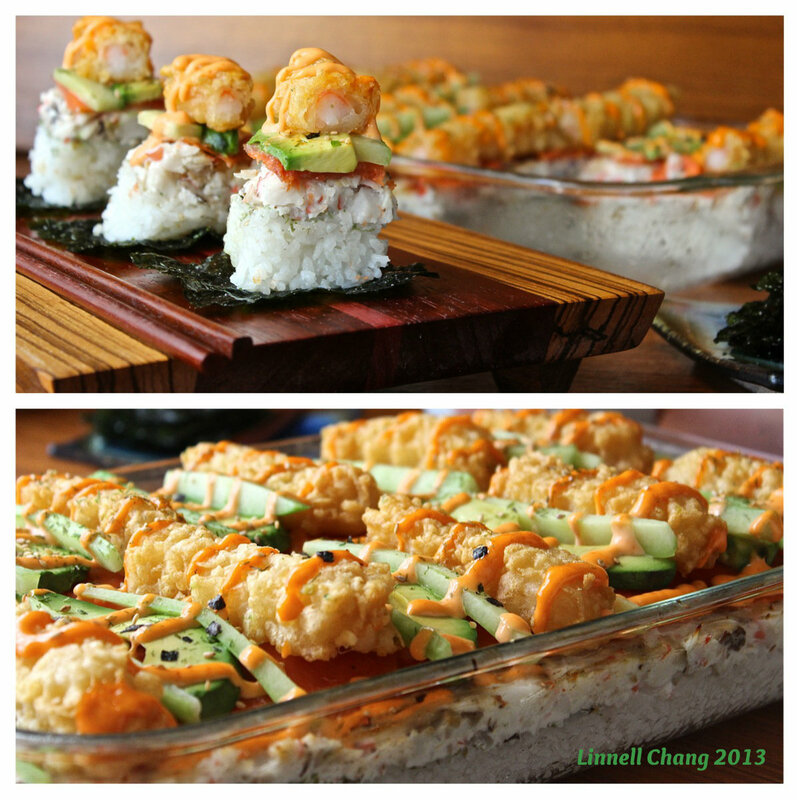 Sushi Casserole | What about this? Creating extraordinary sushi requires great skill and passion. After watching Jiro Dreams of Sushi, a documentary about Jiro Ono, an 87-year-old sushi master, I’m almost embarrassed to share the following recipe. This recipe is far removed from the precise art of sushi-making, but the rumblings of my imagination wouldn’t let go of the idea of creating a sushi casserole. I searched online, sorted through my notes and newspaper clippings, and reread my sushi cookbooks to figure out what layers I wanted for the casserole. My experiment began and, after a fair amount of improvising, I ended up with a tasty casserole that yielded bite-sized squares of “sushi” that were served with roasted Nori. There are endless possibilities to a layered recipe such as this. And, yes, it is possible to stick a square peg into a round hole! 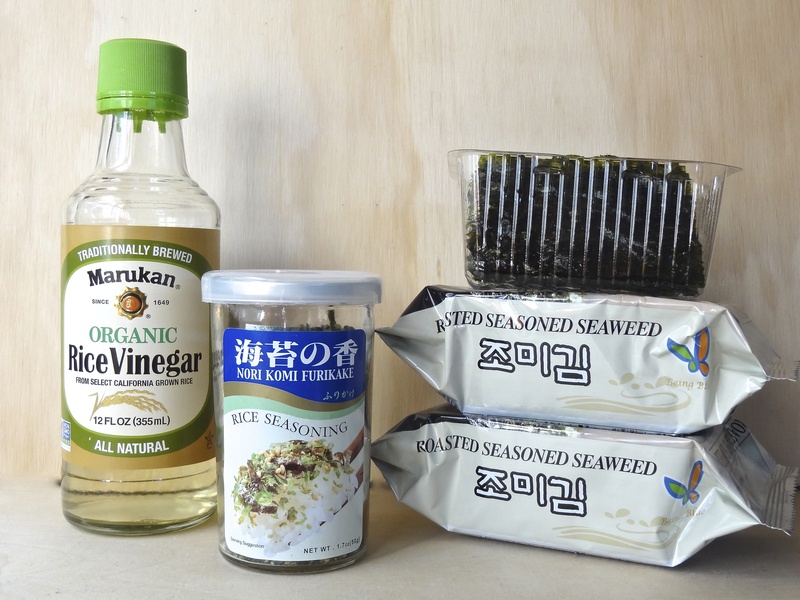 The ratio of vinegar solution added to sushi rice varies with the type of sushi being made. In this case, I’m using a vinegar solution used for making maki-sushi. Normally, the vinegar solution is added to the rice after the rice is cooked. The rice is usually fanned while cooling to give the grains a lustrous or shiny appearance. I cheated by adding the vinegar solution into the rice cooker at the beginning and didn’t fan the rice at all. 1. Wash and drain rice. 2. Put the rice in the rice cooker. 3. Combine vinegar, sugar, and salt in a small bowl. 4. Add vinegar solution to rice in rice cooker. 5. Add water up to the specified cup level. 6. Start the rice cooker. 7. After the rice is cooked, let it cool to body temperature. 1. Chop the imitation crab or place it in a food processor and pulse. Small chunks are desired, not large chunks nor a smooth paste. 2. Combine mayonnaise and sour cream in a medium-sized bowl. 3. Add crab to mayo-sour cream mixture and stir until thoroughly combined. 1. Blend both ingredients together. 2. Pour into a squeeze bottle with a small nozzle tip. 1. In a small bowl, mix 1 cup of water with 2-3 tablespoons of vinegar. Rub this solution on your hands and on any utensils you use to prevent the rice from sticking. 2. Take handfuls of rice and gently and evenly press it into the bottom of a 9-inch by 13-inch pan. This layer should be at least 1/2-inch thick, but no more than 3/4-inch thick. There may be leftover rice. 3. Spread the crab layer over the rice. 4. At this point I put a thin layer of smoked salmon slices over the crab mixture. 5. The next layer, I alternated between the shrimp tempura, avocado slices, and cucumber strips. 6. Finally, I sprinkled some Aji Nori Furikake over the top of the casserole and then drizzled the spicy sauce up and down the rows of toppings. 1. Cut the casserole into small squares. You can either serve the sushi squares directly from the pan or you can plate them on a serving platter. 2. Accompany sushi casserole with squares of roasted Nori, wasabi, and pickled ginger. 1. Sushi should not be put in the refrigerator, because the rice will become hard. It’s most delicious when served just after making it. 2. I made my rice base too thick, so I recommend using enough rice to form a solid base, but not so much that each bite is all rice. 3. I used frozen shrimp tempura from Costco and baked it in the oven while the rice was cooling. 4. For easier cutting and serving, the shrimp tempura could be cut into bite-sized pieces and placed intermittently in rows across the casserole. Another consideration might be to place the shrimp tempura under the crab layer. The same goes for the cucumber sticks. The cucumber sticks could be diced and sprinkled over the casserole.